Memorial Day weekend is two weeks away and that means its time to take your fitness up a notch. Below, I’m sharing four exercises that will help you you’re your body for the beach. Don’t have access to a gym? Don’t fret. These exercises require no equipment (though a yoga mat is recommended) and can be done just about anywhere including right on the beach! So crank up your favorite tunes, grab a friend and start working on your summer bod! This classic leg lift exercise may look simple, but after a few repetitions, it can turn into a challenging workout. On your mat, position yourself on your hands and knees with a flat back and level pelvis. Pull your abdominals up and in. Extend one leg to the rear, straightening the leg in line with your back without tilting your pelvis. Move as slowly as you can, feeling the muscles contract to move the leg. Contract to hold for 10 seconds, and then slowly return the leg to the floor and switch sides. That’s one rep. Try 2 sets of 8 repetitions. 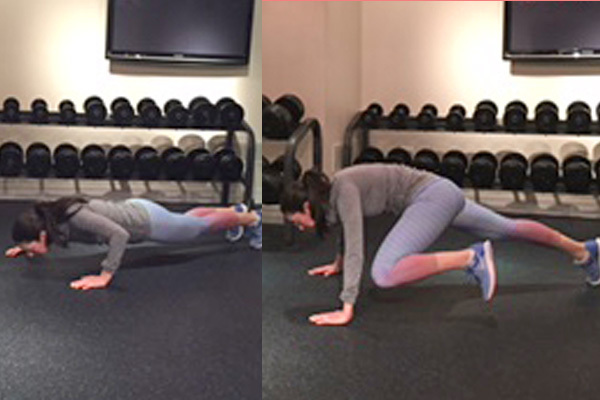 Start in the standard pushup position. As you lower your body toward the floor, lift your right foot off the floor, swing your right leg out sideways, and try to touch your knee to your elbow. Reverse the movement, then push your body back to the starting position. Switch sides by touching your left knee to your left elbow. Continue to alternate back and forth. Do as many as you can in one minute, then do another set. Lay on your back with your arms extending out to your sides and your legs hovering an inch off the floor. Raise your legs over your hips and then lift your hips off the floor and twist to one side, reaching your toes straight up for the sky. Lower to the start and alternate sides. Complete 2 sets of 12-15 repetitions. The key to getting a rocking body is believing you have what it takes to be the best you can be. Say hello to summer and feel slimmer, stronger and more confident than ever! Cheers to a great summer and killer bod!